1. Preheat oven to 400 degrees. Make a stack of 8 tortillas on a cutting board. Use a large knife to cut the stack into 8 equal triangle-shaped sections. Cover 2 baking sheets with tin foil and arrange triangles in one layer. 2. Spray a 1 to 2 second burst of cooking spray on top of the chips and sprinkle salt or other seasonings. Bake for 10-12 minutes or until beautifully browned like above. You got a nice blog! The Tortilla Chips that you used, are they readily available at your supermarket or you made them from scratch? My Mexican grandmother shared this recipe with me when she was sick, so even when lying in bed she could enjoy homemade tortilla chips. I take the corn tortillas and cut them in triangles, but cook them in a sauce pan with a little olive oil. Just add salt and let them cool on some paper towels (to soak up any oil) and walla- chips! I love the sugar option-Thanks for the tip! PS. I work with Ben Keyser- he told me about your blog. Jade, I use store bought corn tortillas, the ones you get in a pack of like 40 for $2. Homemade ones would definitely be better, but that’s a lot of work. Allison, what a smart grandmother! Yes, these can definitely be fried in some oil in a pan and are very delicious. I do it this way because it’s less fat, but frying is still much better than store brand chips. Enjoy! Yay for homemade healthy chips!!!!! Love this recipe. Your blog is simply amazing. Way to go! I agree much better than bagged chips. I fry mine in olive oil but then there are not low fat like yours. I am going to try making the tortillas from scratch some day – they sell the little presses at the mexican grocery store. I have to take a look at your peanut butter dip! Nice job- much better than the bagged variety, I agree. I’ll have the motivation to make my own next time the guacamole craving hits! We love making homemade tortillas too. But, but….can we still keep our $2.99 bag ? Sometimes we need our quick fix at midnight and just need something quick. One great thing about having a recipe blog is that when I’m away from home without my recipe book (blasphemous, I know), I can still make my recipes by checking the site! I just made these at home in Long Island to go along with a Chile Verde (best Chile Verde I’ve ever had, I’ll post recipe soon). Thanks Eskay! Those muffins on your blogs front page still look surreal. Oh yes recipegirl, they go wonderful with guacamole. white on rice couple….sigh…yes you can keep your bagged chips. Just be sure you load em up with some good salsa to mask the non-homemade taste =). I’ve found, though, that the homemade chips stay good and crispy for a few days. I’m not sure if they stay good for longer because they never stay around that long. Home made tortilla chips are lovely. Much healthier and good value for $! Best of all, you can have fun experimenting with spices and herbs on them! The tortilla chips look great. Great idea to add the chipotle chili powder. I used the “variations” on mine, and they were so delicious! I ate so many, it ended up being my entire dinner. These look amazing. You better believe I will be trying these in the very near future. We are nacho lovers at our place. I will let you know how I got along. Just found your blog – love it! I make lots of recipes and plan to make LOTS of yours – thanks for sharing!! Thanks for the comments, hope you enjoy it! I was fooling around with a recipe just like this not too long ago and the chips ended up being rock hard to the point where I felt like I might bust a tooth. They weren’t burned, just totally dried out. I baked them at 350. o well. I’ve only used whole wheat tortillas once or twice and they’re iffy. Some brands work, others don’t. Let me know your results! Yum! You can bet that I’ll be using my wheat tortillas to test this recipe out. Thanks for sharing! Let me know how they work out, I’ve had mixed success with flour-based tortillas. You’re right, the whole wheat tortillas don’t crisp nearly as nicely as the plain floured ones. I think I need to make these this week. I’ve been having a chip craving lately! These will certainly satisfy that craving and more! these look perfectly cut and designed. nice job! 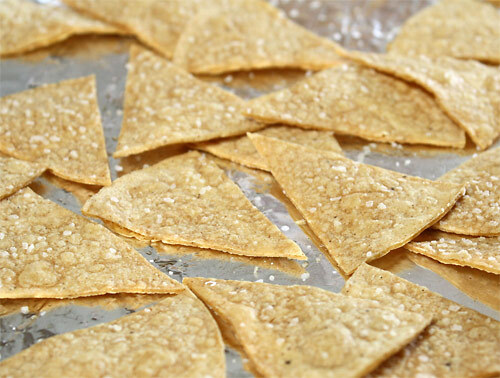 i love making my own tortilla chips–tho Abuelita’s makes good ones!